Last week was busy and stressful. My assistant Isabel and I were preparing publicity for our 14 Big Days of Serving (BDOS) projects. A major challenge was fitting descriptions for all 14 on our one-page handout! This May 19-21 event (details here) is our 9th such weekend of serving, and our biggest. It got me thinking. Where did all these projects come from? How’d we get so many great opportunities to serve? Some are repeats of projects people enjoyed in earlier events, such as project #2 for Feed My Starving Children, and #4 for Community Threads. Some were suggestions of our members. Clarisse loves to knit and suggested #5, knitting scarves and hats to be sent by Operation Gratitude to soldiers and veterans. The Operation Gratitude website led us to a partner project, #10, making cards for these same people. Pastor Greiner knows the pastor of Cross and Crown and that led us to #14, where we can join in their ministry to the homeless and jobless. 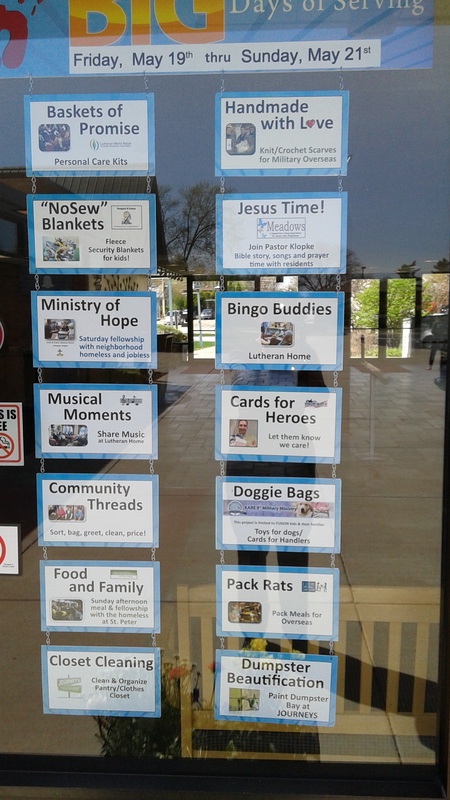 We also like to make a one-time opportunity for some of our ongoing ministries, like #3, Pastor Klopke’s ‘Jesus Time’ for people with developmental disabilities at a residential care facility. Our regular homeless ministry PADS also led us to one time opportunities painting (#12) and cleaning/organizing (#13) for Journeys/The Road Home, the parent organization of PADS. Community Threads, our project #4, is also an ongoing ministry and a major supporter of our ministry. Then there’s the partners we have supported for many, many decades. Project #7 invites people to help assemble the Lutheran World Relief kits we’ve donated items for. We’ve had a strong relationship with Lutheran Home for the Aged, just a few blocks away, for probably 100 years, so it was easy and natural to set up opportunities to serve by playing bingo (#1) and informally sharing our musical gifts (#8). About a year ago, we became acquainted with Timothy’s ministry when they asked to used our facility. Providing food and volunteers for this ministry to the homeless, project #9, gives us opportunity to strengthen that connection. Finally, we chose to try an experiment this year. Two of our Sunday morning ‘families,’ the Encounter worship family, and the Fusion kids’ ministry family, accepted our invitation to host a project of their own. Encounter is inviting others to join them making Linus blankets, our project #6, while Fusion kids and their families are packing goodie bags and making cards for Kare 9 Military ministry dogs and their handlers, our project #11. The more we as a church serve, the more opportunities we find to serve. The more opportunities we offer, the more people take advantage of these easy and fun ways to serve. The more we serve, the more we discover the deeper rewards of following Jesus by loving our neighbors. Are you in? Sign up to serve here.